This listing is for one sterling silver band, made in a hammered style on 1.5mm square wire (14g). The stamping is VERY TINY. 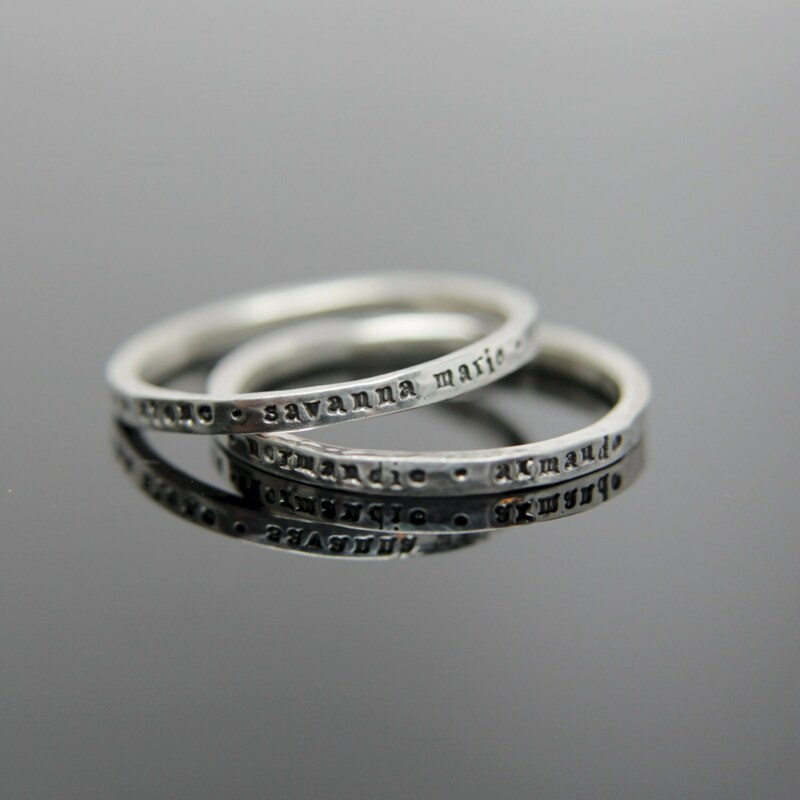 I can fit up to 40 characters depending on your ring size. These can be stacked together to create a wide band look, please size up 1/4 size for 3 rings, size up 1/2 size for 5 or more rings. I made the pictured set for my mom with her kids on one and grandkids on the other and she absolutely loves them! Please refer to my shipping and return policies before purchasing. Square hammered texture band ring in Sterling Silver. Stacking ring add on. One Thin Hammered Band in 14k Yellow Gold, 14k Rose Gold or 14k White Gold. Knuckle size available. One Mixed Twist Band in Sterling Silver and Copper. Stacking Rings. Textured wobble rings set. Seven sterling silver organic stacking rings. Hand textured stacking rings set. Unfortunately I got my size completely wrong, so I had to have it sized locally and lost the black pigment on the engraving, but the ring is still exactly what I wanted!